This episode is called “Pantry Raid III: Cool Beans”. Three bean recipes, is a lot, so I’m breaking them up. 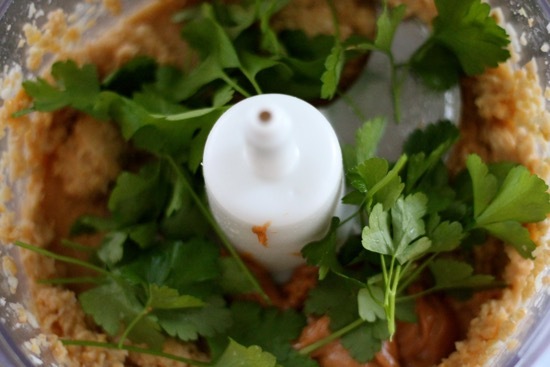 Over beaning is never a good thing Today I’m sharing with you Turbo Hummus. I’m totally in love with hummus. Shhhhh, don’t tell my husband. 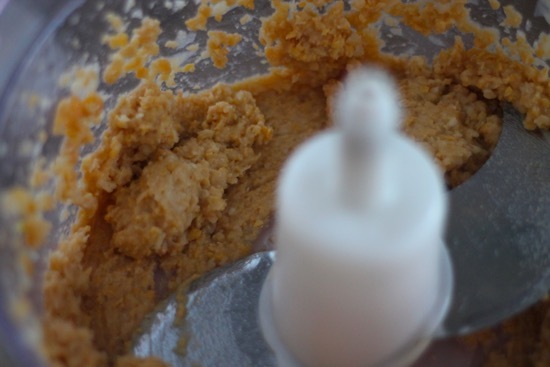 I like to use it on my sandwiches to replace mayo, spread it on crackers as a snack, spread a thin layer over chicken breasts before grilling (it makes the chicken unbelievably moist and adds great flavor) or just dip my finger right in it, while no one is looking, of course. 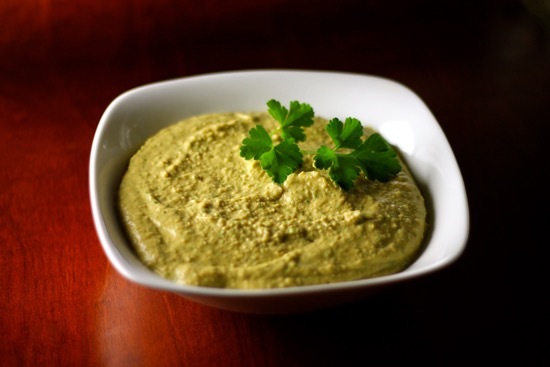 I haven’t found a recipe for hummus that I’ve liked more than the store-bought stuff. I don’t know why this is, call me crazy. I’m a food blogger for goodness sake! This hummus though, I would absolutely make on a regular basis to replace the grocery store variety (insert angels singing). It was smooth and creamy and had the perfect balance of flavors. I was really shocked at how much I loved this. 100% without a doubt, Good Eats! 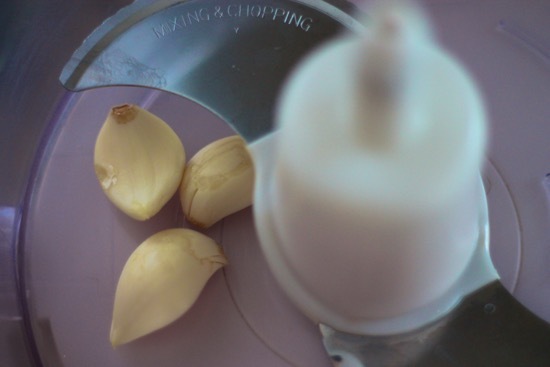 Start off by placing 3 garlic cloves in a food processor. Pulse until they are finely chopped. 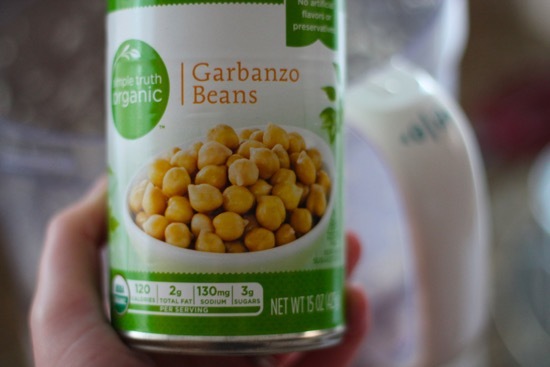 Grab a can of Garbanzo Beans. Drain them over a bowl. Be sure to keep this liquid, we’re going to need it in a few minutes. …and half of the reserved liquid. Pulse until it starts to become smooth. 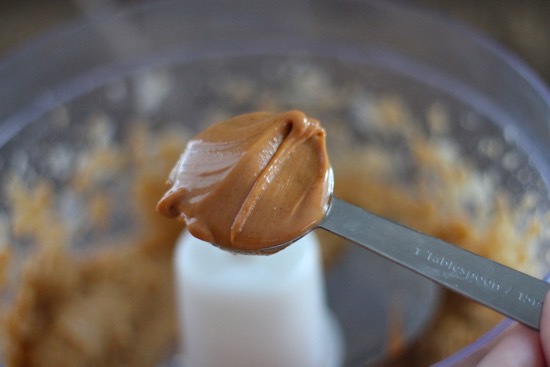 Add in 3 tablespoons of smooth peanut butter. 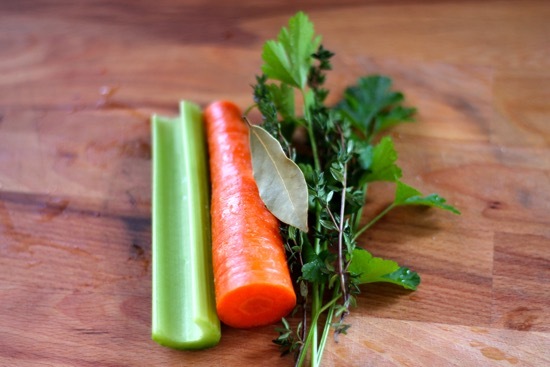 Toss in a handful of parsley. Mines from my very own garden (squeal)! 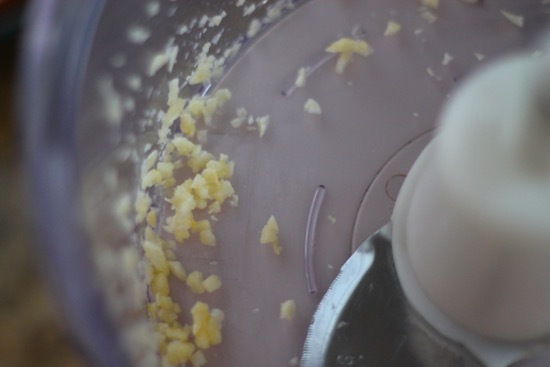 Next, add in the zest and juice of one lemon. 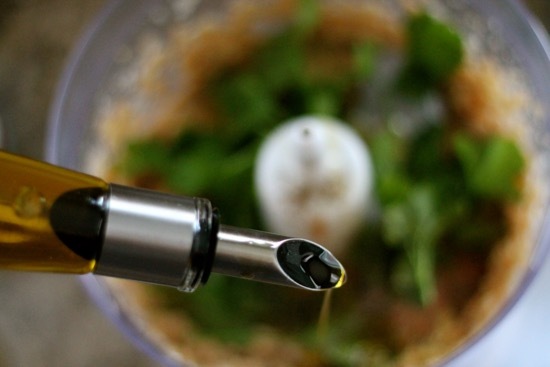 Drizzle in olive oil and continue pulsing to your desired consistency. Scoop into a bowl and serve. 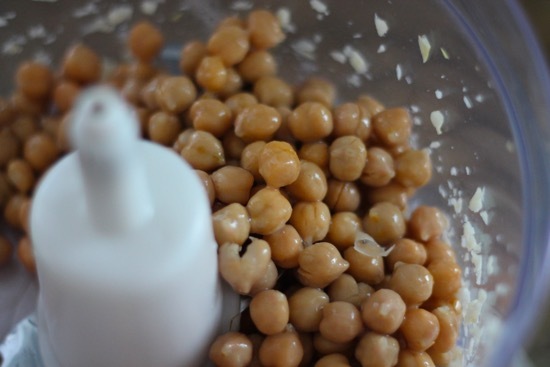 I like my hummus cold, so I would refrigerate mine for an hour or so before serving. 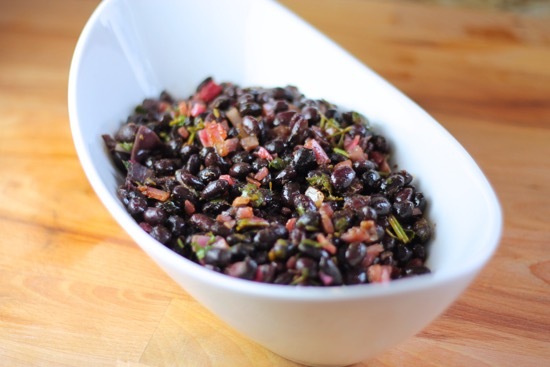 Part 2 of Alton’s Pantry Raid III: Cool Beans Episode, Black Bean Salad. I rarely make a big ol’ pot of beans and I’m starting to wonder why I don’t do this more often. They’re good for you, filling and darn affordable. 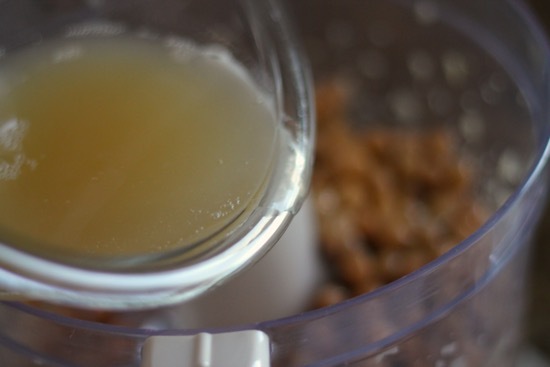 This recipe doesn’t require any soaking, which is good, because you don’t have to plan in advance. There’s been many a times I’ll go to make a recipe and notice I have to let something rise or soak for 8 hours, bad Sarah! It’s something I’m working on. These beans are absolutely delicious! The cooled creamy beans combined so well with the fruity olive oil, tangy lemon juice and the warmth of the cumin and chili powder. You get a little bit of everything in each bite. I now have enough beans to get me through the rest of the year, but I’m certainly not complaining. If you’re a fan of beans, and even if you’re not, you really should give these a try. Start of by gathering celery, carrot, parsley, thyme and a bay leaf. 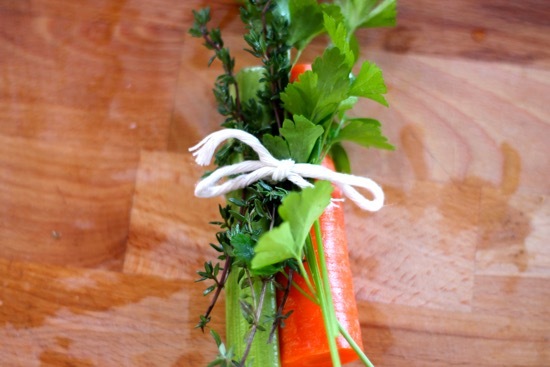 Tie them up in a cute little herb bouquet. 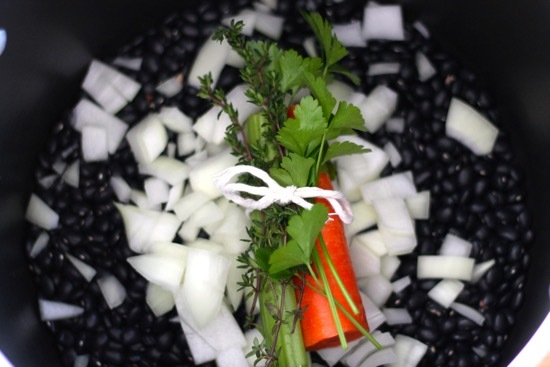 Get a big ‘ol pot and add in your black beans, onion and herb bouquet. 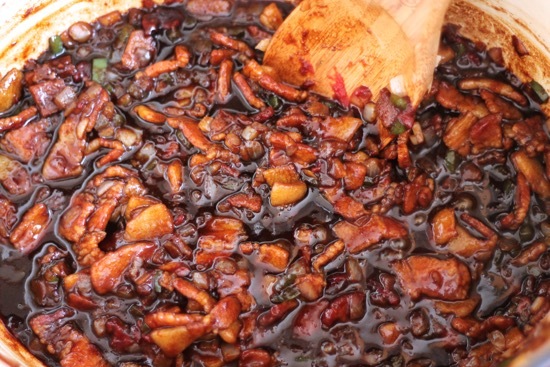 Cover with water and simmer for about 2 hours. Drain the beans and remove herb bouquet. 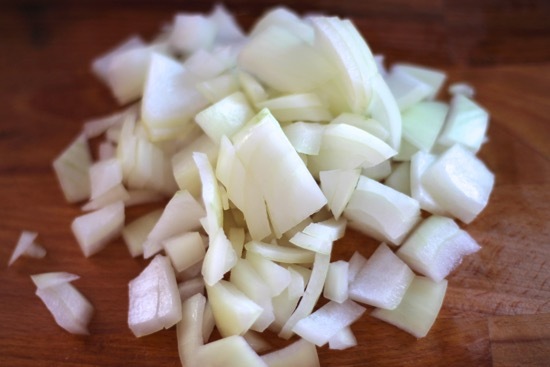 While hot, toss beans with olive oil, red onion, lemon juice, cilantro, cumin and chili powder. Chill throughly and season with salt and pepper. The longer this sits, the better it tastes. 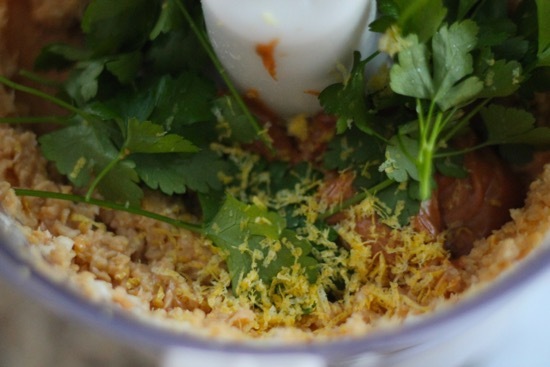 The last recipe for beans from Alton Brown’s Cool Beans Episode. 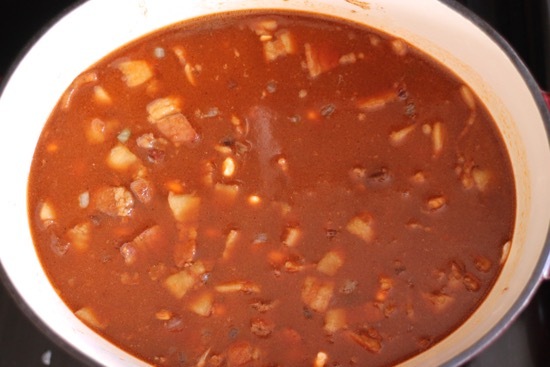 I know you’re all sad, but we’ll get through it together Today we have classic baked beans. This was my first time ever making them, I have absolutely no idea what took me so long. I just adored these beans. They were sweet, smoky and had the perfect little spicy kick. 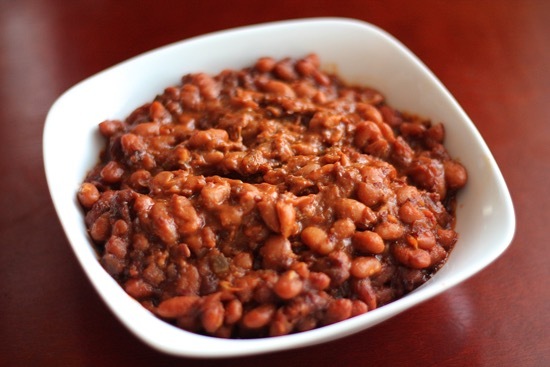 This will be my go to baked beans recipe for all the summer BBQ’s in our future. It does take some time, so plan on doing this on a lazy Sunday when you’ll be lounging around the house for a good 6-8 hours. This recipe requires soaking beans, so you’ll have to prepare a day in advance. 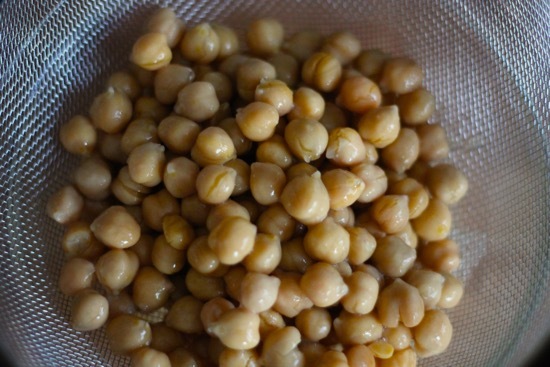 Soak the beans at room temperature overnight for 8-12 hours. 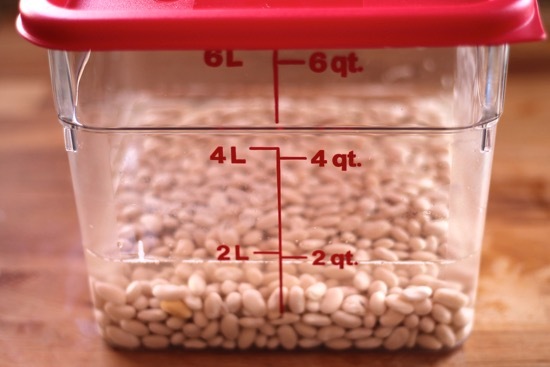 If you soak your beans and aren’t able to use them immediately, seal them in a zip top bag and pop in the fridge for up to 4 days. Thank youChristopher Kimball! 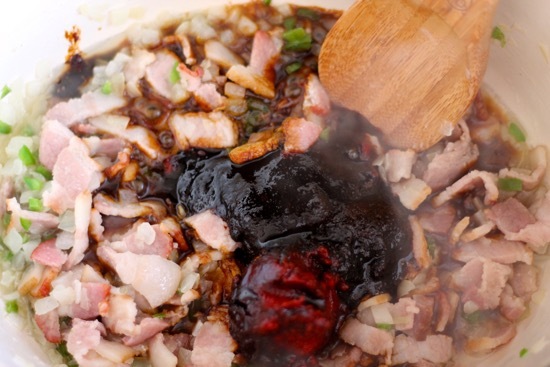 When your beans are soaked and you’re ready to use them, add bacon, onion, and jalapenos to a dutch oven over medium heat. 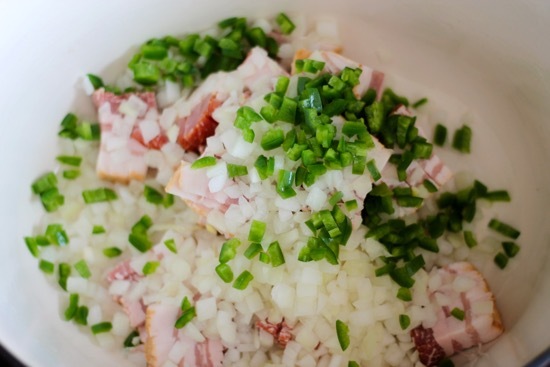 Cook until the bacon fat has rendered and softens the onions, about 5-7 minutes. Add in tomato paste, brown sugar and molasses. 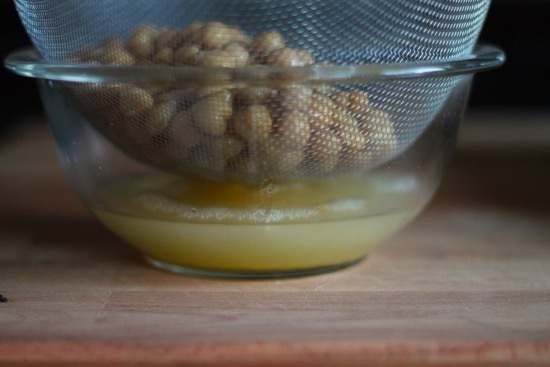 Add in drained, pre-soaked beans and 4 cups of chicken broth. Bring to a boil and stir in cayenne, black pepper and salt. Cover with lid and cook for 6-8 hours in the oven. Every single recipe in this episode was absolutely delicious! Bravo Alton…very Good Eats!